Hey, Square! Finished a remake of your classic RPG but you accidentally put it on a failed handheld? Time for Plan B. A collection of the first two 8-bit FFs with somewhat enhanced graphics and gameplay. Ah, Square, how skillful you doth milk. When times are tough, you just squeeze and there’s a little puddle of gold! There’s no denying that’s what brought on these remakes of Final Fantasy and Final Fantasy II. Originally on the portable WonderSwan, they soon became the only good reasons to import the thing. And so, seizing an opportunity, Square decided to port them over to the PlayStation. Released seperately in Japan, Square has smartly bundled both FFI and II (which was never officially in English) on one disc, called it Final Fantasy Origins and slapped on an MSRP of $29.99. As you no doubt realize, such a setup is impossible to pass up, especially if you’re two filthy nimrods that run a game site. So by using an intricate decision-making process known as Jenga, we made our selections and today present two seperate reviews of both games. We also decided to use a cumulative score of Origins as a whole rather than rate them seperately. It’s not like you can choose your favorite at the store anyway. 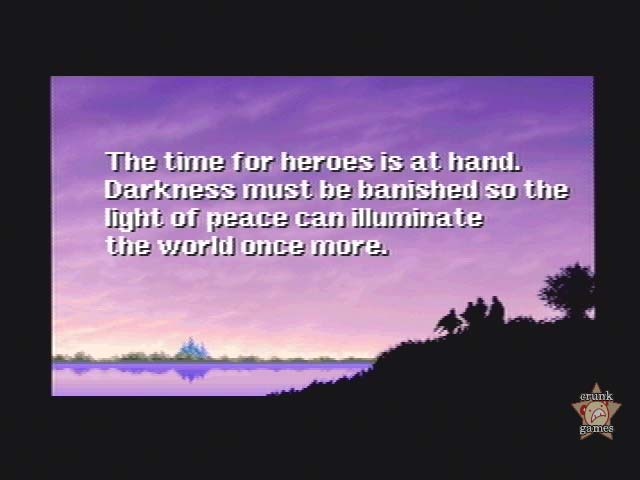 With that, we begin with the original Final Fantasy, a game that would eventually transform so many of us into one of the Internet’s saddest sects of people. Imagine for a moment that the original NES Final Fantasy has come back to life and manifested itself as a delectable sushi dinner platter. This particular dish would consist of a few simple rolls with rice on the side, and despite its modest size, would take a generous chunk of your evening to disassemble. Stuffed fuller than a Thanksgiving bird, you get up afterwards and reflect on the experience; the food was good but poorly arranged on the dish, and because you got the new guy as your waiter, service was slow and not without mishaps. You feel satisfied, but not as much as you know you could be. Keeping this in mind, we now look at the Final Fantasy Origins remake of the game through this same delicious lense. The first thing we notice is that the presentation is obviously better, and the little wooden boat that your sushi navy presents itself on was placed under your maw by the highly skilled waiter who refills your Diet Coke as soon as the empty glass hits the table. You’ve got more choices, better quality, and enhanced service. Best of all, you could buy 99 all at once if you were so inclined. Clumsy as it may be, the analogy highlights a few of the main differences in these two versions of the classic RPG. Children of the NES generation know full well the fun and challenge of the original Final Fantasy but are also well aware of its slow pace, cumbersome battle system, and other, smaller grievances. The remake does away with virtually all of these gripes (the plot still doesn’t make a damn shred of logical sense) and brings the spirit of the game to the table fully intact and much easier to swallow. The enhanced graphics and music certainly don’t hurt the game’s presentation, but more important than cosmetic changes are the hordes of structural tweaks that make the game infinitely smoother than its 8-bit predecessor. The magic system benefits dramatically after graduating from the lowly 4-letter space limitation, and series fans will be familiar with the revised names — Fade is a thing of the past, meaning you’ll gleefully be laying down the smack with Holy. Players can also dash with the O button or call up various menus with the shoulder buttons, including the ever-handy memo save. Battle is, of course, revamped to match the later games in terms of speed and practicality (no more "Ineffectives!") as have the shopping and party management aspects. And finally, for the stockpiler in all of us, curative items need no longer be purchased one. At. A. Time. But how does it play? As you might guess, the overall feel of the remake is very close to the 16-bit Final Fantasy games. The challenge seems to have dropped in proportion to this, and now players even have the option of playing on "Easy" mode. NPC’s give more interesting (and more sensical) information, and the game as a whole feels up to date and friendlier to the discriminating gamer. 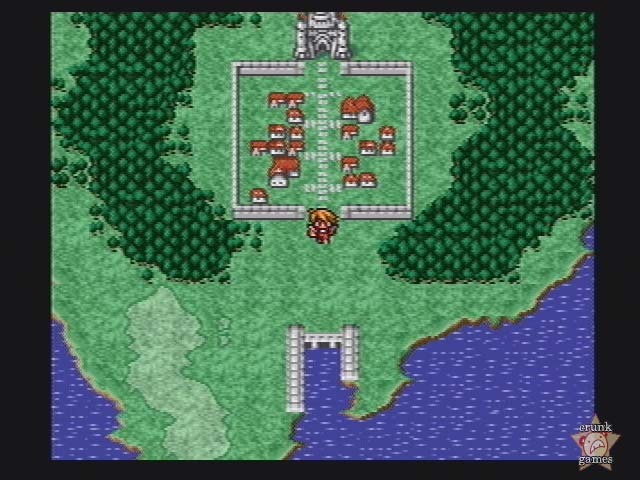 Making up the other half of FF Origins is Final Fantasy II, originally released for the Famicom in 1988 (and later on a 2-in-1 cartridge with FFI, oh what delicious coincidence!) but never making its way to the west for whatever silly reason. The game was historically significant beyond being "the second one"; it was a rethinking of the Final Fantasy formula that established concepts that would carry on later in the series. Most significant was the move towards a more character-driven quest as opposed to FFI’s "playing a class". This time, a collection of distinct heroes was brought to the forefront, each one having — gasp! — their own names. 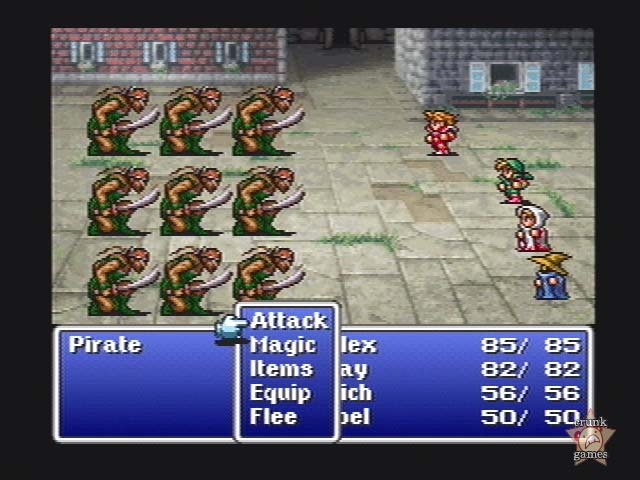 FFII also brought on changes to stat-building and battle mechanics, which almost every FF since would feature in their own ways. 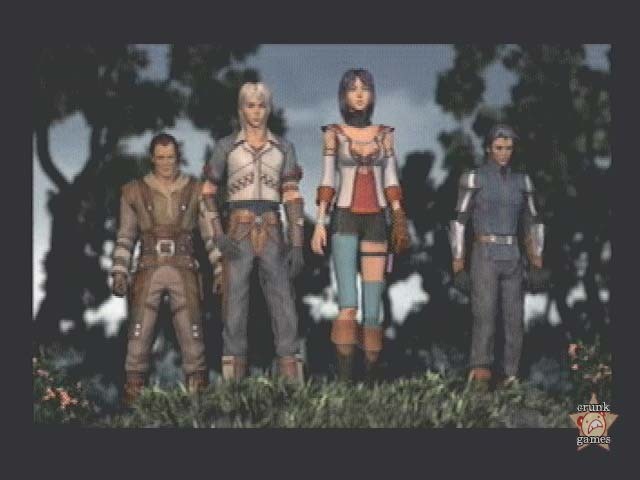 Firion, Maria, Gus and Leon are a group of childhood friends driven out of their hometown by not-so-nice imperial forces. Since the only family they have now is each other, they join a rebel alliance and strive to seek answers behind the empire’s goal of world conquest while getting in all sorts of mini adventures inbetween. It may not win awards for originality, but then again, FFII’s story is pretty much what you’d expect from a formerly 8-bit RPG. Just praise the higher beings that its translation carries none of that stigma. 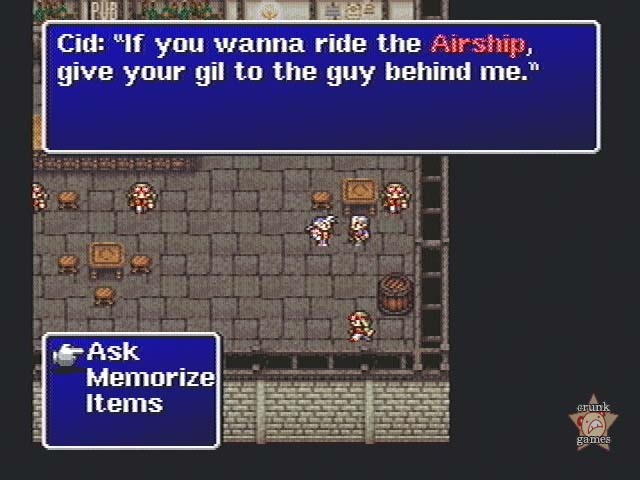 Conversations in the game are sometimes peppered with "ask" points, set up in the same way as Wild Arms 3’s own ASK system. Occasionally, if someone you’re talking to mentions something special, the subject word will be highlighted in red and a menu will appear, prompting you to either ask what the word is, memorize it if it’s a password of sorts, or give the character an item. All I can say about this is that I’m glad not many RPGs have copied this idea. It’s little more than a distraction; a way to make you press a button an extra time and overall just an unneeded element in the game. In this business, logic dictates that the first couple of sequels of a game would not stray too far from its source material, especially not an RPG. Well, despite how much FFI ruled the hearts of every kid on the playground back in the day, something happened inside Square and logic was not part of the process in designing FFII. While the game has the usual blue windows and airships and Cid and whatnot, its stats system is a total rewrite. Basically, there are no such things as levels in FFII. In fact, you might say that to gain experience, you truly do have to experience. To put it very simply, let’s take an average battle scene in the game, and one of your party members keeps getting wailed on by the Ogre Mage in the back row. If you let that party member keep getting wailed on to the point of near-death and make it through the battle, their maximum HP will no doubt rise. This is pretty much the entire concept, where frequency dictactes advancement. Similarly, if you keep whacking things head-on rather than use magic, expect the skill with that weapon to improve. All the other variables like evasion, magic defense and so on are also affected as battles rage on. The whole thing requires you to keep up to snuff, because you’ll definitely run into a relentless castle or cave full of enemies eventually. This does slow progress down a little bit, but probably won’t faze obsessive level-uppers. Regardless, it’s an interesting approach. Like the previous game, FFII on PSX is also a rather exact graphic port of the WonderSwan version. The sprites are still as big as your pinky nail; smaller than FFI’s, even! Still, it’s much better-looking than FFIV or V, with excellent use of color and featuring gorgeous backgrounds, especially in battles. And frankly, if you’re playing on a PS one LCD screen, it’s all a non-issue. The music, also, is respectable, with arranged tracks that do their job well, especially the haunting world map theme. And attacking in battle with blade weapons gives you a satisfying SHING noise! Oh yeah, hurts so good. Seriously, like there was any doubt that you were going to pass up remakes of the first two entries in one of — if not the — most successful and enjoyed RPG series these two dorks can think of. If nothing else, Final Fantasy Origins should at least do something to satiate the old-school crowd, and at an extremely appealing price to boot. If you don’t have the scratch for that shiny new PS2 and want to give your poor, dying PSX one last nibble, make it this one.